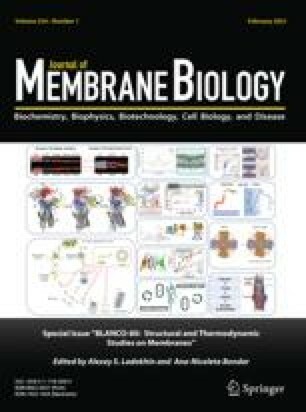 A fluorescence method is described for the measurement of ATP-driven ion fluxes in lipid vesicles containing purified Na,K-ATPase. The membrane voltage of enzyme containing vesicles was measured by using a voltage-sensitive indocyanine dye. By addition of valinomycin the vesicle membrane is made selectively permeable to K+ so that the membrane voltage approaches the Nernst potential for K+. With constant external K+ concentration, the time course of internal K+ concentration can be continuously measured as change of the fluorescence signal after activation of the pump. The optical method has a higher time resolution than tracer-flux experiments and allows an accurate determination of initial flux rates. From the temperature dependence of active K+ transport its activation energy was determined to be 115 kJ/mol. ATP-stimulated electrogenic pumping can be measured as a fast fluorescence change when the membrane conductance is low (i.e., at low or zero valinomycin concentration). In accordance with expectation, the amplitude of the fast signal change increases with decreasing passive ion permeability of the vesicle membrane. The resolution of the charge movement is so high that a few pump turnovers can be easily detected.